If you want to practice mindfulness in the workplace, your brain may need a little rewiring. Your brain is made up of neurons, which are like wires that carry electrical current from one place to another. Each neuron is connected to many others. The brain is the most complex organism in the known universe and scientists still have very little idea about how it works. In the 1970s, many students were taught that the brain gradually deteriorates as a person gets older. The prevailing view was that the brain can’t improve itself and that neurons die off as you age. That view was incorrect! You can create new connections in your brain at any age. Your brain is unique and shaped by your daily experiences and what you pay attention to. If you’re a violinist, the part of your brain that maps touch in your fingers is actually larger. If you’re a taxi driver, the part of your brain responsible for spatial awareness is more pronounced. And if you’re a mindfulness practitioner, the areas of your brain that control focus and manage emotions are more powerful, and the area responsible for higher levels of well-being (the left prefrontal cortex) is more. An explosion of interest in the study of mindfulness has recently occurred. Centers for mindfulness have been established at numerous universities all over the world. Examples include the UMASS Medical School for Mindfulness, UCLA’s Mindful Awareness Research Center, and the UCSD Center for Mindfulness. 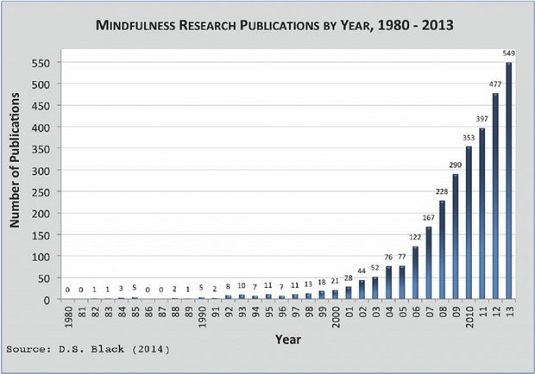 This image shows the growth in publications on mindfulness between 1980 and 2013. Growth in research into mindfulness. Most people feel that their mind is all over the place. In fact, some people who practice mindfulness even think that the exercises make them less focused! Studies show that the opposite is true. When you sit down to be mindful, you’re much more likely to notice each time your mind becomes distracted. Usually, your mind is so focused that you don’t even realize it. Brain scans reveal that even after just a week or so of daily mindfulness practice, the parts of the brain dedicated to the paying attention (which include the parietal and prefrontal structures) become more activated. In other words, you are actively improving your brain’s ability to pay attention. Longer-term practitioners appear to have more permanent changes in the brain, showing a greater propensity to be in the present moment even when in a resting state. In his most recent book, Focus: The Hidden Driver of Excellence (Harper Paperbacks), psychologist Daniel Goleman argues that incessant use of technology, such as emails and text messages, has rendered young people increasingly distracted. He goes on to say that current research suggests that mindfulness exercises enable the brain to rewire itself and become more focused. Mindfulness directly helps to strengthen the networks in your brain associated with concentration and open presence, and allows you to choose to engage in free association when you need to. Children love stories. Adults love stories. Have you ever wondered why? The brain is designed to be hooked by stories. Stories switch on the visual part of your brain. Because stories are formed of connecting ideas, they tune into the connections in your own brain. Some people refer to the brain as a story-telling machine. Think about when you first wake up in the morning. Your mind is blank and then, suddenly, whoosh! Who you are and where you live and that long to-do list come to mind. That’s the storytelling brain at work — not always terribly exciting and often repetitive. But mindfulness is different and much more interesting. If your brain is in a more mindful state, you’re focused on the present moment, which engages a different circuitry in your brain. You can access the present moment right now by noticing the sensations that your body is experiencing as it sits. Do you start to become aware of your poor posture or notice tension in your neck? You can now start to notice information from the world around you: the size of the tree outside, the wispy clouds and hints of a blue sky beyond. That’s present-focused attention. When you’re more present-moment focused, rather than running on your default network all the time, you’re more in control of your life. Instead of finding yourself aimlessly surfing the web, you can catch yourself and choose to get on and finish your work. If you’re lost in thought after thought, you can’t make a choice about what you’re doing until you snap out of the dream. Mindfulness offers you that choice. Make a concerted effort to engage your present-moment focus for the next 8 hours or workday. If you think 8 hours will be too challenging, try 1 hour. Use any free moments in the day to focus your attention on your bodily sensations and breathing or smells, tastes, and sights. In any given moment when you’d usually let your mind wander, choose one of the preceding and observe. Focus your attention on just that one thing. What did you discover or notice? Is your mind more clear and focused? How did you cope with the distractions that your mind created?